Thoracic aortic calcification (TAC) and coronary artery calcium (CAC) have been proposed for risk assessment of coronary artery and cardiovascular disease events. The aim of this analysis is to assess the prevalence of TAC and to determine its relationship with cardiovascular risk factors and CAC in a general unselected population. 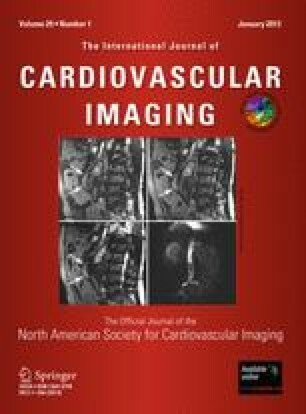 TAC was measured from electron beam computed tomography scans and quantified by Agatston-Score in 4,025 participants aged 45–75 years (mean age 59.4 ± 7.8 years, 53 % female) from the Heinz Nixdorf Recall Study. Multivariable generalized linear regression was used to evaluate relationships between TAC and cardiovascular risk factors and CAC. Overall 2,538/4,025 (63.1 %) participants revealed TAC. Prevalence of TAC was greater in men than in women (65.2 vs. 61.7 %, p = 0.009). TAC was most strongly associated with age, systolic blood pressure, smoking and high levels of LDL-cholesterol. Prevalence of CAC was significantly higher in participants with TAC than without (74.0 vs. 57.6 %, p < 0.0001) demonstrating an increased risk of having CAC in the presence of TAC (prevalence ratio (PR) 1.29 [95 % CI: 1.22–1.35], p < 0.0001, PR adjusted for risk factors 1.14 [1.09–1.20], p < 0.0001). In general population, TAC has high prevalence and largely shares cardiovascular risk factors with CAD while being independently associated with present CAC. We thank the Heinz Nixdorf Foundation, Germany, for their generous support of this study. This study is also supported by the German Ministry of Education and Science (BMBF), and the German Aerospace Center (Deutsches Zentrum für Luft- und Raumfahrt (DLR)), Bonn, Germany. We thank Prof. Dr. K. Lauterbach (Dept. of Health Economy and Epidemiology, University of Cologne, Germany) for his valuable contributions in an early phase of the study. The authors thank the participants of the Heinz Nixdorf Recall study and the entire community of Heinz Nixdorf Recall investigators and staff for their support and valuable contributions. None of the authors have declared a conflict of interest or financial disclosures.